A Day That Lives in Infamy: Remember January 30. As this New York Times piece reminded me, seventy five years ago, this was a truly bad day. Just past noon (about six hours ago, Berlin time) on January 30, 1933, Adolf Hitler took an oath administered by President Paul von Hindenburg, and assumed the office of Chancellor of Germany. Einstein, of course, was right, which doesn’t surprise me — I hear he was a pretty smart guy. But what I want to emphasize here is one lesson I learned in the writing of that tome that seems to me to have resonance in other circumstances, even ours now, perhaps. That is: Hitler’s ascension to the chancellorship was a disaster—but not an inevitable one. He certainly did his part to reach that pinnacle, but there were literally dozens of points at which he could have been stopped – even up to the last months and weeks. The outcome turned on many factors of course, but certainly among them were the inaction of those who might have defended the German republic throughout its troubled birth and early years; and then, at the end, the disastrous folly of those who were trying to destroy it for their own ends – and hoped to turn Hitler to their purposes. It doesn’t only require active, purposeful malice to incinerate a civil society (h/t Balloon Juice). Aloof disdain and especially pure self-interested stupidity act as accelerants to the bonfire. (I had a couple of links there – but I don’t want to Godwinize this post, so fill in the blanks as you will). 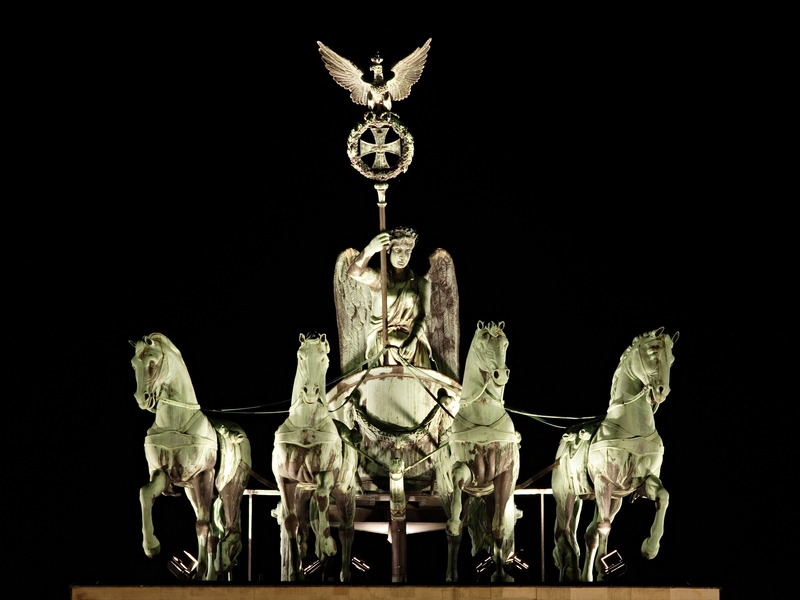 Image: Brandenburg Gate Quadriga at night. Photo by Johann Gottfried Schadow, used under a Creative Commons Attribution ShareAlike 2.5 license. Update: tweaked a little for readability (horrible word). The actual record of events in 1931 and 1932 includes several key turning points at which he could have been stopped altogether. That he was not turned on the failures of both his nominal allies and of his enemies. Chief among Hitler’s foes were, of course the Communists of the KPD. The economic crisis had helped them at the polls too, just as it had boosted the Nazis. Following the 1930 elections, their seventy-seven Reichstag delegates were only outnumbered by the Social Democrats and the Nazis. Their leadership, however, was at once inept and ultimately self-destructive. Cynical and stupid, they formed a common cause with the National Socialists. On the surface, the interests of the two radical parties were the same: both wanted to destroy the democratic functioning of the Republic to pave the way for a new, revolutionary regime. Street fights between KPD and Nazi gangs were often setups, pre-arranged in order to help make real the impression of lawlessness that governed Berlin in 1932. The two parties joined in the Reichstag to block any significant legislation, particularly if it were intended to improve Germany’s dire economic condition. The KPD seems to have believed itself at the vanguard of history. Apparently, all it thought it needed to do was to create a crisis, any crisis, and power would flow to it. Such calculations provided a ghastly echo of Liebknecht’s fatal mistakes in 1919. The outcome was the same and for the same reason. In 1932, as at the end of the war, the radical left failed to count the guns arrayed against them – and their leader, Ernst Thälmann, would pay for that error with his death in the Buchenwald concentration camp. Papen’s key delusion was that he could use the Nazis and then discard them at will. To avoid a vote of confidence in the Reichstag, he had to promise the Nazis that he would call new elections for the summer, and as an extra bonus, he lifted Hindenburg’s ban against public appearances by men in SA and SS uniforms. The move amounted to an a open invitation to murder. Within five weeks, ninety-nine people lay dead and over one thousand were injured in fighting in Prussia alone. Such mayhem, of course, formed a central argument in the three electoral campaigns in the early months of 1932. First came presidential elections in March, when for the first time, Hitler ran for the highest office in Republican Germany. The run off pitted him against the incumbent, Hindenburg, and the Communist, Thälmann — and the final vote had been far closer than anyone had expected. Hindenburg won, but his total of 19.4 million votes gave him a much smaller margin against the combined totals of 13.4 million for Hitler and 3.7 million for Thälmann than in either of his previous victories. Next came the April elections for control of state parliaments, which left the Nazis in commanding positions in virtually every region of the country. Finally, in the Reichstag elections in July, the Nazis used the chaos in the streets to argue that only a truly strong man could save Germany — only Hitler. The tactic worked. The elections ended with the National Socialists holding 230 seats in the Reichstag, up from 107 in 1930. The Nazis were now the largest political party in the chamber. Brave words by a man not usually remembered as defender of pluralism. But he could not make them stick. Schleicher and Papen had fallen out irretrievably. Despite Hindenburg’s antipathy to him, Schleicher was able to force his way into the chancellorship. Papen then began to agitate for a return to power in coalition with the Nazi party. In early January, 1933, Schleicher sought to defuse the threat by seeking a dissolution of the Reichstag and the right to rule Germany by decree — a move he had opposed when Papen had proposed it months before. Hindenburg turned him down flat. Schleicher could call new elections if he chose, but the president refused to allow his chancellor to rule as a dictator. Meanwhile, Papen continued to meet with Hitler to forge a coalition between the Nazis and conservative Parliamentary parties, negotiations brokered by right-wing business leaders. Schleicher, faced with Hindenburg’s virtually complete lack of confidence in him, resigned on January 28. Papen now agreed to serve in a new government in which Hitler would be chancellor. Hindenburg, feeling the pressure from several sides, finally gave in. Hitler still had never won an election outright; by most measures, his support was dwindling, and those who had observed him at close quarters recognized, as Hindenburg had, that a Hitler government would almost certainly turn into a violent dictatorship. Nonetheless, at 11:00 in the morning on Monday, the 30th of January, 1933, he was formally sworn in as chancellor of the German Republic. The Great Man theory of history has come in for much abuse over the years. Most famously, Tolstoy railed against it in War and Peace, in which he tried to demonstrate that Napoleon the man was an insignificant actor in the actual events that decided his disastrous Russian campaign. In kindred arguments, Hegel’s idea of history and its Marxist heirs emphasized a logic to history, progress achieved by the clash of forces too large and impersonal for any one person to affect. Reworked, ideologically cleansed, extended and re-analyzed, such approaches are now ordinary tools for historians — and they are not all wrong, far from it. But at certain times and in particular places, there can be no doubt that the individual matters, that the life or death, the rise or fall of a single person reverberates through the experience of untold, unnamed millions. From Einstein in Berlin, pp. 404-408. This entry was posted on January 30, 2008 at 12:26 pm and is filed under History, memory, Politics, tyranny, Uncategorized. You can subscribe via RSS 2.0 feed to this post's comments.